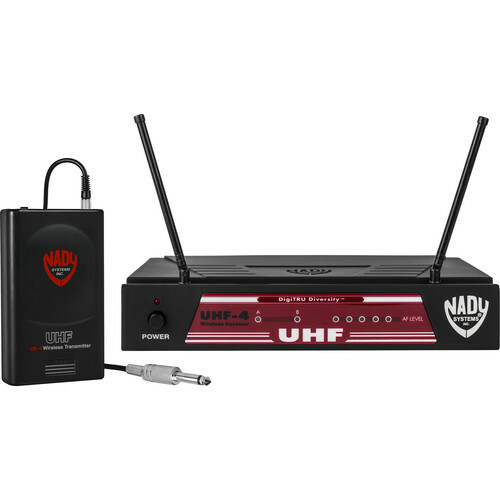 The UHF-4 UHF Wireless Diversity Guitar System by Nady brings you a complete wireless solution for guitar. The system is straightforward and easy to operate with the UHF-4 receiver and UB-4 Bodypack transmitter. These two are a match made in heaven. Now you can play rhythm guitar or shred a killer lead without being restricted by a long, cumbersome cable. The UHF (Ultra-High Frequency) range avoids crowded VHF bandwidth and features DigiTRU diversity technology offering low noise, maximum range and dropout protection for long-lasting and reliable reception.